Landing Pages in Mailchimp can help you grow your audience and promote products and services. Published landing pages are easy to share on the web or in other Mailchimp campaigns, so you can start driving traffic to your page. You can edit, unpublish, or delete a landing page at any time. In this article, you'll learn how to create and manage a landing page in Mailchimp. Take a moment to learn about Landing Pages in Mailchimp. Landing pages must be associated with an audience in your account or your connected store. We'll prompt you to make this choice when you go to build your page. You can unpublish, edit, and republish a landing page at any time, but the URL and associated audience or store can't be edited after a page has been published. The Landing Page Builder does not prevent you from publishing if you've left default content in your layout. We strongly recommend you preview your landing page and review your settings before you publish. iframes and custom HTML can't be used in landing pages. Because merge tags pull individual contact data from your audience, they can't be used in public landing pages. First, you'll choose the type of landing page you want to create, then you'll design your content and configure the page settings. To create your page, follow these steps. Click to start your landing page. Type a name for your landing page. This name is for your reference, and isn't visible to landing page visitors. Use the drop-down menu to select an audience. Contacts who sign-up on your landing page will be added to this audience. Click to select a template. You can learn more about landing page template options in our article About Landing Pages. Drag content blocks into your layout and customize the content for your landing page. If you need some inspiration, check out our design tips. Landing page templates include a logo placeholder, which is designed to automatically pull in your default brand logo. To learn more about this placeholder and how to use it, read Set a Default Logo. Click Preview in the upper-right corner to see what your page will look like. After you've designed your content, click Save & Close. Read on to learn how you’ll set up your landing page. You can return and make edits to the design at any time. To add a page title, follow these steps. Type the page title your contacts will see in their browser’s title bar and click Save. All users can edit their landing page URLs. Paid users can also add a verified email domain to the URL. To use your own domain on a landing page, you’ll first need to verify a subdomain. Choose to Use your own domain or Use a Mailchimp domain. Click the drop-down and choose the subdomain you want to use. In the field, type the new URL. Click the drop-down and select the verified email domain you want to use. In the field type the new URL. 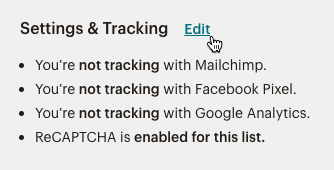 In the Settings & Tracking section you can add Track with Mailchimp, Facebook Pixel, or Google Analytics on your landing page. We’ll also let you know if reCAPTCHA is enabled. To edit the tracking options for your landing page, follow these steps. To turn on Track with Facebook Pixel, you might need to enter additional information depending on your ad type. If you want to use existing Pixel ID, enter it in the field. To turn on Google Analytics, enter your Google Analytics ID. That’s it! As soon as you publish, we'll start gathering data as people visit and interact with your page on the web. 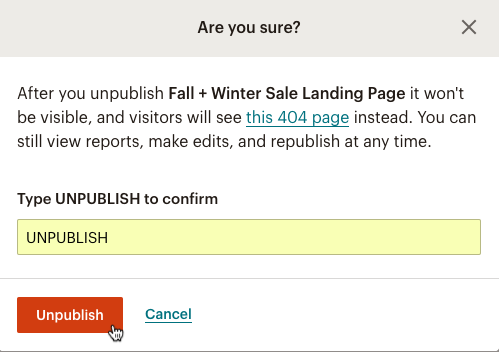 When you're ready, click the Publish button to publish your landing page. After you publish, your page will be live on the web but unindexed so no one will see it until you share the link. We'll compile report data as people visit your page and sign up for your marketing or make purchases. Learn more about landing page reports. After you publish, it's time to drive traffic to your landing page so you can start seeing results. Here are a few things you can do. Promote and share your page with your contacts through other campaigns you create in Mailchimp. Create an automation for your landing page subscribers or customers, run an ad and link your page in your call to action, or include it in a regular email campaign. You can also copy and share the custom URL for your landing page on any social media platform. We’ll start compiling reporting data as people visit your page and sign up for your marketing or make purchases. If you used a Signup page template, you can segment your audience to target contacts who sign up through your landing page. Send them an automated welcome series or email campaign with a special offer! After you’ve published a landing page you can edit, unpublish, or delete it. You can make changes to the design of a published landing page at any time. 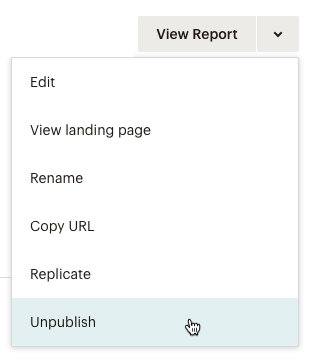 Because we use the original page settings to compile your report metrics, you can't change the page title, URL, or the audience or store associated with the page. To edit a landing page, follow these steps. Click the drop-down menu for the page you want to work with, and click Edit. Make any desired changes to your page. When you're ready, click Save and Publish to immediately publish changes. Way to go! Your changes are now live on the web. To unpublish a landing page, follow these steps. Click the drop-down menu for the page you want to work with, and click Unpublish. In the pop-up modal, type UNPUBLISH, and click Unpublish. You can leave your landing page unpublished, edit and republish, or delete it. Just like any campaign in Mailchimp, when you delete a landing page from your account, you'll also lose all its reporting data. We strongly recommend you unpublish landing pages you want to take offline, but keep the campaign in your Mailchimp account so you can access its data. Both unpublished and deleted landing pages will display a 404 page not found message when someone attempts to visit the URL. If you still need to delete a landing page, check out Delete Campaigns from Your Account. 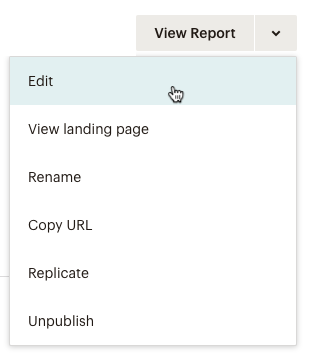 Learn how to view reports for your landing pages and what data you can expect to find, including clicks, visits, and revenue. Learn how to use the Signup Form block in your landing pages, and customize its styles and settings. Add a background or hero image to your campaign or automation. Get style tips to take your design to the next level.